It’s been almost three decades since the release of “The Ultra-Violence”, and even though none of Death Angel’s later albums achieved the same success, the Bay Area band has always stood way above the average thrash metal acts. No, I won’t say that “The Evil Divide” is a turning point in their career or that it’s their best album since the aforementioned “The Ultra-Violence”; but I will say that it’s a hell of record. Osegueda says he and Cavestany have grown as songwriters and as much cliche as that may sound, once you hear the classy riffing of “The Moth”, the riveting darkness of “Lost”, the rampage of “Father Of Lies” and its silky solo, the boldness of “It Can’t Be This”… Well, once you hear the whole thing, you’ll realize that “mature songwriting” is indeed the best choice of words. Without playing “sophisticated” thrash, Cavestany’s strings have always sounded somewhat technical, but this time he’s clearly stepped up his game. 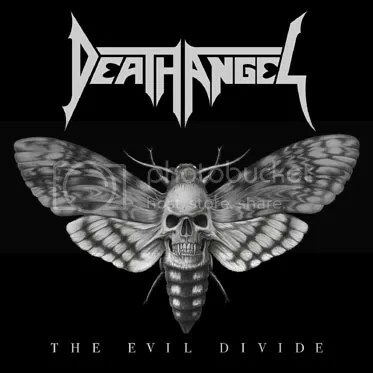 The whole band has and “The Evil Divide” manages a balance between old school and modern, between raw and refined aggression. Osegueda wanted this album to please both “casual” and die-hard fans. I think his wish will be granted.